Born in the castle of Château de Thorens to a well-placed Savoyard family, the eldest of twelve children born to François de Boisy and Françoise de Sionnz. His parents intended that Francis become a lawyer, enter politics, and carry on the family line and power. He studied at La Roche and Annecy in France, taught by Jesuits. Attended the Collège de Clermont in Paris, France at age 12. In his early teens, Francis began to believe in pre-destination, and was so afraid that he was pre-emptorily condemned to Hell that he became ill and eventually was confined to bed. However, in January 1587 at the Church of Saint Stephen, he overcame the crisis, decided that whatever God had in store for him was for the best, and dedicated his life to God. Studied law and theology at the University of Padua, Italy, and earned a doctorate in both fields. He returned home, and found a position as Senate advocate. It was at this point that he received a message telling him to "Leave all and follow Me." He took this as a call to the priesthood, a move his family fiercely opposed, especially when he refused a marriage that had been arranged for him. However, he pursued a devoted prayer life, and his gentle ways won over the family. Priest. In 1593 he was appointed provost of the diocese of Geneva, Switzerland, a stronghold of Calvinists. Preacher, writer and spiritual director in the district of Chablais. His simple, clear explanations of Catholic doctrine, and his gentle way with everyone, brought many back to the Roman Church. He even used sign language in order to bring the message to the deaf, leading to his patronage of deaf people. Bishop of Geneva in 1602. He travelled and evangelized throughout the Duchy of Savoy, working with children whenever he could. Friend of Saint Vincent de Paul. He turned down a wealthy French bishopric to continue working where God had placed him. With Saint Jeanne de Chantal he helped found the Order of the Visitation . A prolific correspondent, many of his letters have survived. The value of his writings led to his being declared a Doctor of the Church by Pope Blessed Pius IX in 1877, and a patron of writers and journalists by Pope Pius XI in 1923. The Salesians of Don Bosco, the Oblates of Saint Francis de Sales, and the Missionaries of Saint Francis de Sales are named in his honour as is the Saint François Atoll in the Seychelles Islands. Oldest of five children born to farm workers Stefano and Maria Cagna; his mother was devoted to Our Lady of the Rosary. When financial troubles hit, his father worked as a butcher and sacristan, and Giuseppe spent his early years in a house adjacent to his parish church; at one point he served as an altar boy for Blessed Giacomo Alberione, his future superior. Giuseppe early felt a call to the priesthood, and began his studies in October 1908; he was known as an exceptional student in seminary, but would not talk about it. Drafted into the army on 22 January 1915, he worked in a medical unit and later said that the locations of his military assignments put a severe test to his vows of chastity. He was released from service on 7 January 1916 due to chronic anemia, and returned to seminary where he spent his spare time tutoring other students. Father Alberione wanted the young seminarian to work with him in his new Society of Saint Paul, but Giuseppe was informed that he could only remain a cleric if he stayed in seminary. He joined the Society on 7 April 1917, trained and supervised student printers, edited and proofread books and periodicals, all the while continuing his studies. Ordained on 19 October 1919, the first professed priest in the Society. He made his profession within the Society on 30 June 1920, taking the name Timoteo in honour of the disciple of Saint Paul the Apostle. He preached retreats, heard confessions, and each Sunday walked the 8 miles to Benevello, Italy to celebrate Mass for the parish there. He earned a degree in theology, with honours, from the College of Saint Thomas in Geona, Italy on 12 November 1920. As the Society continued to grow, so did Father Timoteo's work load. He was noted within the Society for spreading the word of the Faith and of the Church's stance against the Facism that was coming to power in Italy; he was also known for his lack of administrative and financial skills, which often put him at odds with Father Alberione and dealing with overdue bills. Still, his devotion was so powerful that Father Alberione assigned Father Giuseppe to found the Society's first house in Rome, Italy; Pope Pius XI jumped for joy at the news. On 15 January 1926, Father Giuseppe and 14 students opened a small print shop in Rome, and began work on twelve diocesan weekly publications. Father Timoteo and his crew lived in a renovated warehouse with limited plumbing and no chapel. With no other priests to assist him, Father Timoteo served as house superior, father figure, spiritual director of both his house and the newly arrived group of Daughters of Saint Paul, house treasurer, and supervisor of the printing work they all did. They were perpetually short of money, and his work never ended, but visitors noted the serenity and dedication that pervaded the living and working areas. In July 1927, Don Giaccardo managed to purchase a old vineyard from the Benedictines; the barn was transformed into a chapel, the winery to print shop, and the farm house into improved quarters for the Society; it became a central point for training, study and spiritual formation of new members of the Society. Father Giuseppe was made superior in Rome in 1932. On 10 June 1936, the old vineyard was designated the mother-house of the Society, and Don Giaccardo its superior; he laboured at task for the next decade, which were his most active years, and the period when the house was most know for its piety, observance and community. He worked with about 500 students and seminarians in Alba, Italy during this period, and kept his community together during the privations of World War II. Celebrated Mass every Friday at the mother house of the Pauline Sisters. He carried a small edition of the epistles of Saint Paul, and consulted them frequently for wisdom in dealing with his community; falsehoods saddened him, he would lose sleep to pray for Society members who had a conflict, he saw all history as being centered on Christ, and encouraged members of the Society to use all forms of media to spread the Faith. Born to the nobility, the eldest of seven children born to Giampaolo Gambara and Taddea Caterina Martinengo. In her youth, Paula showed an affinity to a quiet and devout life, felt a call to religious orders, and spent her spare time spent in prayer and spiritual reading. However, in the autumn of 1485 she was given in an arranged marriage to the Lodovico Antonio Costa, Count of Benasco, Piedmont in modern Italy. Mother of Giovanni Francesco in 1488; she celebrated by distributing large amounts of food to the poor. Lodovico was a philaderer who enjoyed the worldly life, the party life, hunting, feasting, and was abusive and contempuous with Paula for her pious life and her devotion to the poor; his mistress moved into the castle to live with them both in 1494, and soon after Paula began suffering severe migraines. She discussed the matter with her confessor and spiritual director, Blessed Angelo of Chiavasso, and decided to make the conversion of Lodovico the focus of her spiritual life, joining the Franciscan tertiaries in 1491, suffering the abuse of both her husband and their servants, and putting the needs of the poor and the sick above her own. Miracles are reported where bread given to the poor would multiply, and barrels of drink that her husband emptied would suddenly refil. Her prayers were finally answered in 1504 when Lodovico had a conversion, received a miraculous healing at the grave of Blessed Angelo Carletti, and became a penitent man; Paula began wearing her Franciscan habit in public instead of under her gowns as she had done until then. Widowed in late 1504, Paula devoted her remaining years to God and charity, which included financing the re-building of some area convents and monasteries. Daughter of a stocking manufacturer, Marie was raised in a pious household and educated by her mother and the local parish priest. Her mother died when Marie was 22, at which point she took over running the house and raising her younger siblings. When her father died in 1683 she took over his business, modernizing it by bringing in machinery to do work previously done by hand; Marie learned to run all the machines, trained her employees, and set up one of the first support networks of benefits them. She joined the Dominican tertiaries in 1690, and began transferring business responsibility to her brother Charles. President of the local Confraternity of Charity, an affiliate of the Society of Saint Vincent de Paul in 1693 and 1694, and began caring for people in her home. In 1695 she moved to Sainville, France where she founded a house that would become the Sisters of the Presentation of the Blessed Virgin (Dominicans of the Presentation of the Blessed Virgin; the community received legal recognition in 1724, diocesan approval in 1738, and they continue their good works today. His mother was Mella, his father Sillán, son of Conall, descendant of Rudraige Mór of Ulster. Monk. Spiritual student of Saint Ciarán at Clonmacnoise. Founded a monastery to the west of Lemanaghan, Ireland, c.645 on land obtained by Saint Ciarán from the king of Connacht. The monastery has a healing well that came from a spring that opened when Manchán, out of water, struck a rock; there was also a separate cell where his mother retired. In addition to the contemplative life he led at the monastery, he evangelized the people around it, teaching scripture, being a spiritual teacher to any who would listen, and caring for the poor where he could. Poet. Spiritual student of Pope Saint Eleutherius during his missionary days. Priest. Consecrated bishop of Foligno, Italy by Pope Victor I in Rome c.204; he was the first bishop given the pallium as symbol of his office. For a time, Felician was the only bishop in northern Italy. 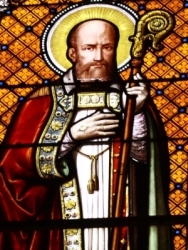 Ordained Saint Valentine of Terni as priest. Arrested, tortured and martyred at age 94 in the persecutions of Decius, dying en route to a triumph for Decius. Bishop of Antioch in 240. In 244 he refused entrance to liturgical services to emperor Philip the Arabian, due to the emperor having murdered his predecessor; he ordered him to take his place among the penitents by the church door, which the emperor did. During the persecutions of Decius, Babylas made an unwavering confession of faith in public; he was thrown into prison. Martyr. Studied in colleges and seminaries of Piedmont, Italy and Sarvano Skarnafacio. Ordained as a priest of the diocese of Sapë, Albania on 12 March 1921. Parish priest in Ipeshkvninë, Albania. Accused by the Communist government of being a spy for the Vatican, he was arrested on 8 December 1946, imprisoned, abused and finally executed in public as a lesson to anyone who intended to stay true to Christianity. Joined the Dominicans at age ten and lived under their Rule for 70 years. Noted for his devotion to the Blessed Virgin Mary, his life of prayer, and his ability to counsel and re-invigorate the faith of his brothers. Supported the reform work of Blessed Raymond of Capua. There are reports of people who heard him in conversation with Mary - and they report hearing both sides of the conversation. Legend says that when Marcolino died an angel in the form of a beautiful child walked through the streets announcing the death, disappearing afterwards. Eldest son of William Ireland of Crofton Hall, Yorkshire, England and Barbara Eure of Washingborough, Lincolnshire, England. Studied at English College, Saint Omer, France. Joined the Jesuits at Watten, Belgium in 1655; made his profession and was ordained in 1673. Confessor to a Poor Clare convent at Gravelines, France. Sent to England in 1677 where he used the name William Ironmonger and ministered to covert Catholics. Jesuit procurator of the province. Arrested on 28 September 1678 and falsley accused of complicity in the Titus Oates Plot. Martyr. Brother of Saint Sabina of Troyes. Raised a pagan. Disillusioned with his life in Samos, he travelled to Gaul where he met and was converted by Saint Patroclus of Troyes. After Patroclus's martyrdom, Sabinian took up his teacher's work, preaching and baptizing in the area of the Seine. Martyred in persecutions of Marcus Aurelius. Feeling a call to religious life, Eusebia declined several marriage proposals and finally moved to Milas, Caria in Asia Minor (in modern Turkey), taking the name Xenia, and living as a pious lay woman. No details about her life have survived, but she is reported to have been a miracle worker. Hermit in a cave in Mesopotamia on the banks of the Euphrates near Edessa, and then on Mount Sinai. Legend says he ate only once a week. Ministered to and encourged Christians persecuted by Julian the Apostate. Enemies proclaimed that Julian was a follower of Arianism. He travelled to Antioch in 372, made several public speeches against the heresy - then returned to his cave where he lived the rest of his life. A brief biography of Julian was written by Saint John Chrystostom. Franciscan Capuchin friar. Murdered by Marxists in the Spanish Civil War. Layman. Servant of Blessed William Ireland and other Jesuits in London, England. Arrested on 28 September 1678, accused of having received £1500 to help in the Titus Oates Plot. Served time with Blessed Thomas Pickering. Martyr. Fifth century bishop of Cingoli, Italy. Abbot of a monastery at Sora, Italy. When the Lombards invaded the region, Suranus gave away all the goods of the monastery to refugees. When the Lombards reached the monastery and found nothing left to plunder, they murdered Suranus for spite. Martyr. Benedictine monk. Friend and spiritual student of Saint Bertinus. Aide to Saint Omer. Missionary in northern France and Flanders, Belgium. Abbot of Saint Quentin abbey. Imperial Roman legate. While on his way to Spain on an mission, he fell ill and settled in Clermont, France. There his sanctity was so obvious that he was chosen bishop. Hermit in Syria. Called Kriptophagus (the barley eater) as he ate nothing but moistened grain for 40 years. Healer in Syria, Phoenicia, and Cilicia using prayer and holy water. Holy woman whose relics are enshrined in the church of Saint Artemius in Clermont, France. No details of her life have survived. 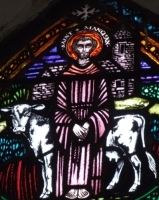 Son of Maelchu, the man who "owned" Saint Patrick when he was enslaved. Converted by Saint Patrick. Helped to evangelize Ireland. Bishop of Granard, Ireland. Spiritual student of Saint Babylas. Martyred in the persecutions of Decius. Spiritual student of Saint Babylas of Antioch. Martyr. Student of Saint Babylas. Martyr. Podlasie is an area in modern eastern Poland that, in the 18th-century, was governed by the Russian Empire. Russian sovereigns sought to bring all Eastern-rite Catholics into the Orthodox Church. Catherine II suppressed the Greek Catholic church in Ukraine in 1784. Nicholas I did the same in Belarus and Lithuania in 1839. Alexander II did the same in the Byzantine-rite Eparchy of Chelm in 1874, and officially suppressed the Eparchy in 1875. The bishop and the priests who refused to join the Orthodox Church were deported to Siberia or imprisoned. The laity, left on their own, had to defend their Church, their liturgy, and their union with Rome. On 24 January 1874 soldiers entered the village of Pratulin to transfer the parish to Orthodox control. Many of the faithful gathered to defend their parish and church. The soldiers tried to disperse the people, but failed. Their commander tried to bribe the parishioners to abandon Rome, but failed. He threaten them with assorted punishments, but this failed to move them. 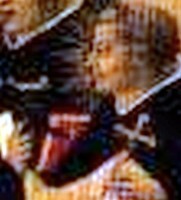 Deciding that a show of force was needed, the commander ordered his troops to fire on the unarmed, hymn-singing laymen. Thirteen of the faithful died, most married men with families, ordinary men with great faith. Was this not the lot that befell Wincenty Lewoniuk and his companions, the martyrs of Podlasie? As faithful "servants" of the Lord, they trusted in his grace and gave witness of their belonging to the Catholic Church in fidelity to their Eastern tradition. They did so with full awareness and did not hesitate to offer their lives as a confirmation of their loyalty to Christ. 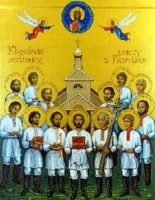 Not sparing themselves, the martyrs of Pratulin defended not only the parish church in front of which they were killed, but the Church that Christ entrusted to the Apostle Peter, the Church which they felt a part of, like living stones. They shed their blood in union with the Son of God, cast out of the vineyard and killed (cf. Mt 21:39) for man's salvation and reconciliation with God. By their example and intercession, Wincenty Lewonink and his 12 companions, who today are raised to the honours of the altar, invite us all to advance courageously on the way to the full unity of the entire family of Christ's disciples, in the spirit of the ecumenical directives of the Second Vatican Council. A group of Christians martyred together for their faith. The only details to survive are four of their names - Eugene, Mardonius, Metellus and Musonius.